Recently I have transitioned from an 8 hour working week as a student to a 9-5 real-world working girl. And what a slap in the face waking up to an alarm at 7.30 every morning is. Especially after 3 years of having the choice of whether to wake up for a class at 9 or.. just attend another one later on, and no alarm! Having said that, I don't have it anywhere near as bad as half of my friends. But still, I am in mourning over my loss of those long gone luxuries of student life. One of the things I will miss a lot is a long lunch. I used be able to order a pot of tea, and have time to sit there and get a re-fill. But now I have to be much more efficient with lunch. Although, that might be a bit of an exaggeration because it was a long lunch, at a restaurant serving interesting, healthy and really delicious salads (Ottolenghi), on my first day of work that gave me the final bit of inspiration for this Beetroot Salad with Roasted Sweetcorn and Mint. Beetroots are everywhere are the moment. August is their season. You can get them ready cooked any time of the year. But now is the time to buy them raw. The rewards of cooking them yourself are truly great. Thier flavour intensifies as they bake/steam slowly in their own juices. They are paired with a cooling yoghurt dressing that turns the most beautiful colour as the beetroot juices seep into it - this salad needs to come with a warning for turning your lips pink! Roasting sweetcorn for the salad was an epiphany. Crispy and crunchy yet still sweet and juicy inside. Roasted sweetcorn is a dish transforming addition to any recipe. This salad is vibrant and tasty and tastes even better the next day - perfect for any lunch box! I took some for lunch paired with this bread. Start by washing your beetroot thoroughly. Wrap loosely in foil with the garlic cloves. Make sure that there are no gaps to ensure your vegetables cook in their own steam. Place on a tray in case any juices escape, and place in a preheated oven at 190˚c for 1 ½ hours. It’s a long time, but honestly the beetroots take on the most wonderful flavour cooking in their own steam. Much better than the beets you can buy ready cooked. Next roast the sweetcorn. Coat the sweetcorn in ½ tbsp of oil, ¼ tsp salt, ½ tsp cumin and ½ tsp paprika in a bowl. Then tip out onto a baking tray and bake in the oven for 10 minutes at 190˚c. Whilst the sweetcorn is roasting, make your yoghurt dressing. Pass the yoghurt through a sieve to ensure your dressing is smooth and lump-less. Squash out garlic clove from its skin and use your knife to smooth into a paste. Add this to the yoghurt. Season with a pinch of cumin and stir together. Peel and slice your cooled beetroot into rounds, about 1cm thick and arrange on a plate (as fancily as you like). Lightly drizzle some good quality, extra virgin olive oil over the beets and season with a small pinch of salt. Once your sweetcorn is done you are ready to assemble. 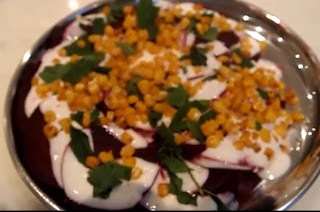 Simply spoon the yoghurt dressing over of the beets. Scatter with roughly torn mint leaves and handfuls of crispy sweetcorn. This dish is best served at room temperature.